SPACE on Ryder Farm is a nonprofit residency program located on the grounds of a 224-year-old working organic farm in Putnam County, New York, just an hour north of New York City. SPACE’s mission is to create an environment singular in its ability to invigorate artists and innovators and their work, and to contribute to the sustainability and resourceful preservation of one of the oldest organic family farms on the East Coast. SPACE’s philosophy is simple: artists and innovators need time and space to do what they do best: create. Each year, SPACE welcomes approximately 150 residents to Ryder Farm for fully-subsidized residencies of one to five weeks. 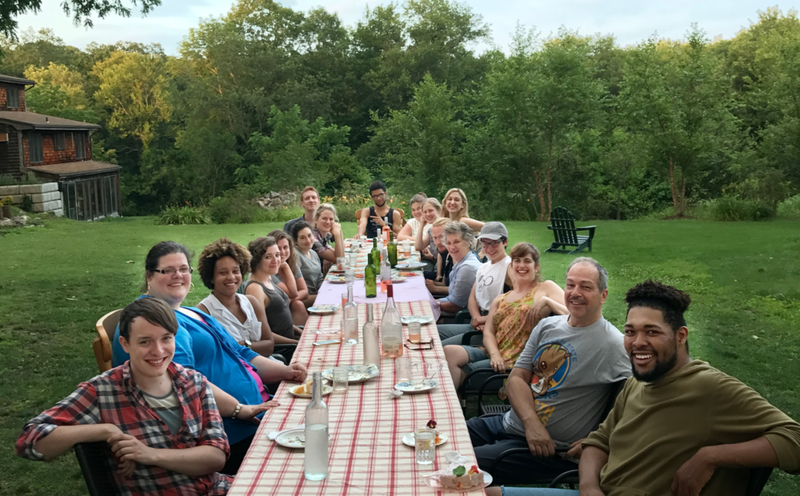 There are only three requirements of residents while at SPACE: attend three communal meals daily, give back two hours to Ryder Farm, and share what you’ve developed with your fellow residents at the culmination of the residency. Through its various residency programs, spanning playwriting to filmmaking to social justice, SPACE has hosted over 1,200 residents since its inaugural season in 2011, and has developed a reputation as an incubator for some of our culture’s most exciting and relevant creators. SPACE is proud to count among its many alumni Academy Award winners, Tony Award nominees and winners, Pulitzer Prize finalists, Guggenheim fellows, Obie Award winners and MacArthur "Genius" Award recipients. SPACE was founded by artists for artists. The story begins in late 2009, when Executive Director Emily Simoness, a 7th generation Ryder family member, visited Ryder Farm for the first time. Taking in the natural beauty of the property and its historic buildings, Emily, then an actress, saw the potential for an artistic home away from home for the artists she knew that were fighting to make their work while making a living in New York City. With the help of an army of inspired artists, volunteers, friends and family, SPACE on Ryder Farm was born. With its roots in the theatre community, over the years SPACE has grown into a place where artists of all disciplines, as well as nonprofit organizations, activists and community organizers come to do their most important work. SPACE has instituted a Family Residency that provides childcare for parent artists, held symposia on the intersection of creativity and activism, launched a Film Lab, created a mentorship residency for very early-career playwrights, nurtured more than 50 young professionals through its intern program and has preserved historic buildings while supporting and championing the organic farming operations at Ryder Farm.